Last holiday of the school year! Hope you had a safe and restful Memorial Day yesterday! As is the case with so much of our historic, collective knowledge, many people today only see Memorial day as another 3 day weekend, or maybe as the last holiday of the school year. But what it was suppose to be was a day when everyone in the USA remembered all those who have given their life in service to our country. The holiday was originally called "Decoration Day" because organizations or individuals would place a small flag on the graves of soldiers who had died defending our country. Some of you may even be old enough to remember when you purchased a small red paper poppy to wear on May 30th each year. The proceeds for those sales went to assist disabled veterans or as was the case in France, orphans of fallen military. In Canada, the day for honoring soldiers is November 11 and is called "Remembrance Day." Almost every country has a day to remember the sacrifice that was given by the brave men and women of the military. But over the years, and some say because the US passed the National Holiday Act of 1971 which created the Monday observance of most holidays, the true meaning of the holiday is lost in the revelry of the infamous 3 day holiday! All of this "musing" on my part about holidays and history had me thinking about the history and development of special education. As our membership grays out, and more of the pioneers in the field retire, will we lose the collective knowledge we possess from where special education came from and if so, is that inevitable, good, bad, or of no consequence? 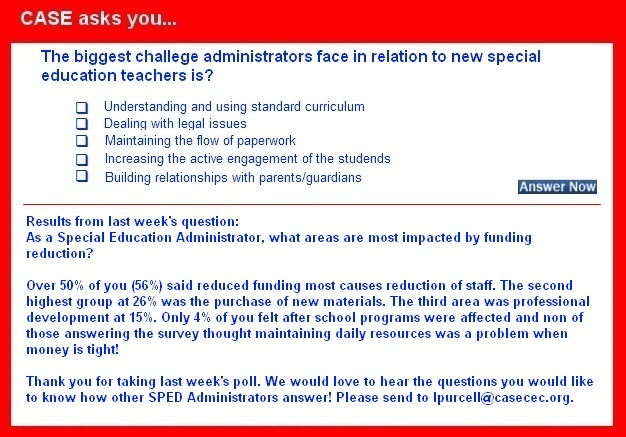 CASE has spent several of our professional development opportunities to look at "Re-inventing" special education. Several states, most notably, Colorado, have spent months/years looking at this topic. I received just this week a proposal from MO-CASE leadership on a year-long look at "Special Education Renewal and Reform." One of the advantages of having an active, thriving international/national association is to be able to connect the dots, to be a repository of information, to be a resource and/or provide resources. If your state or provincial unit is contemplating looking at the "next steps" in our field, please contact me so we can connect you with others who are also spending time in reflection, research, and planning in order to take the best action steps for our students and the future of our field. We truly are so much better when we are working together! Your CASE To Do List for the week of May 27th! Answer the IDEA Survey when you receive it! Watch for your Lucky 21 # 6 — it was mailed to all CASE members on Thursday, May 16. Register for the 11th Annual Legislative Leadership Summit. Send your suggestions for "polling questions" to CASE Office. What will a $2 billion dollar cut to IDEA and Title I look like to children? Unfortunately, our children might be able to answer this question very soon. Yesterday, the House of Representatives voted to approve a top line number for education funding for Fiscal Year 2014 that — if passed — will likely cut some programs. For the first time in many years, the Diagnostic and Statistical Manual of Mental Disorders has been revised. This is the fifth revision of this important manual, which is the diagnostic reference manual used primarily by clinicians in the U.S. to diagnose mental disorders. The drafters had been proposing several changes over the last few years as a part of this current revision process. The APA has published three separate drafts of the manual on their website, and received over 13,000 comments from 2010 — 2012, as well as thousands of emails and letters. As you may know from our story last week, the U.S. Department of Education is hosting an online discussion on transition from school to work for youth with disabilities, in conjunction with the U.S. Departments of Health and Human Services, and Labor, and the U.S. Social Security Administration. The purpose of this discussion is to get experts and stakeholders in the field discussing current federal programs and standards for transition, and new and innovative ways to ensure that students with disabilities are graduating college and career ready. The U.S. Department of Education is now accepting applications for a new award for a National Technical Assistance Center to Improve State Capacity to Accurately Collect and Report IDEA Data. The purpose of this grant is to fund a technical assistance center which will support improved capacity of states to fulfill data requirements. The center will help the state improve data collection to meet the requirements of IDEA by improving data collection infrastructure between Local Education Agencies, State Education Agencies, schools, and early intervention services, and by addressing personnel training. To meet the requirements of the grant, the center must conduct assist in developing technology and tools to help education agencies meet data requirements, and must provide technical assistance and dissemination. Federal education officials are looking to reshape the way they evaluate each state's compliance with special education law to put a heavier focus on student performance. Up to 10 percent of children — two or three kids in every classroom — are thought to have learning disabilities, and a new review finds these disabilities have complex causes and suggests possible approaches. A state-by-state analysis of the most recent data on graduation rates for students with learning disabilities shows that while more of those students have been leaving high school with a standard diploma, many states are struggling to reach the national graduation rate average of 68 percent for students in that disability category. Students with learning disabilities — dyslexia, dyscalculia, or auditory or visual processing disorders, for example — make up about 41 percent of the students who are covered under the Individuals with Disabilities Education Act. Have you faced challenges when it comes to getting your kids with LD or other special needs engaged with sports? The world of competitive athletics these days, even for school-aged kiddos, can be both rewarding and uber-competitive. But for kids with AD/HD, dyslexia, autism spectrum disorders and other developmental and learning differences, finding a way to fit in and get up to speed in a team setting can prove to be extra challenging. Common Core promises new tests. Will they be better than the old ones? Tests that can assess students' mastery of skills and knowledge are as important as the Common Core standards themselves, say many educators and education reformers. Will the tests that accompany Common Core be any better than those states are using now? The hope is they will be, but it will be about two years before the answer is clear. Federal education officials are looking to reshape the way they evaluate each state's compliance with special education law to put a heavier focus on student performance. The U.S. Department of Education reviews how well states perform under the Individuals with Disabilities Education Act annually, determining whether the state "meets requirements," "needs assistance," "needs intervention" or "needs substantial intervention." The evaluations take into account a variety of factors including dropout and graduation rates, whether or not students with disabilities are disproportionately suspended or representative of certain racial groups and post-high school outcomes. Up to 20 percent of children in the United States suffer from a mental disorder, and the number of kids diagnosed with one has been rising for more than a decade, according to a report released by the U.S. Center for Disease Control and Prevention. In the agency's first-ever study of mental disorders among children aged 3 to 17, researchers found childhood mental illnesses affect up to 1 in 5 kids and cost $247 billion per year in medical bills, special education and juvenile justice. Today's young people must graduate from high school with the skills necessary to succeed in the 21st century global economy. And that certainly includes youth with disabilities. To that end, the U.S. Department of Education's Office of Special Education and Rehabilitative Services and the U.S. Department of Labor's Office of Disability Employment Policy are working closely together to create opportunities for youth with disabilities to graduate college and career ready. The latest compilation from the U.S. Department of Education (from 2010-2011) reports that about 13 percent of public school enrollment consists of students served by special education programs. That count has pretty much stayed the same for the last 13 years. What's different now is that, as technology pervades all aspects of the classroom, special education teachers need to make a decision about whether they're going to stay on track with specialized assistive technologies or adopt some of the mainstream ones that general education students are using. With many teachers not trained to spot dyslexia, Sally Bouwman shares her advice for detecting the disorder. "The one thing my postgraduate teacher training course had simply not prepared me for was that more than a third of my first class of seven and eight year-olds might not be reading and writing with any degree of confidence. Granted, it was a school in special measures, and many of the pupils did not have the clear structure, support or guidance at school, or, in some cases, at home, that would help progress their literacy skills." Christine Park, the president of New York Life Foundation, writes: "In the months since the horrific Newtown school shooting, a media spotlight has glared on the nearly 450 surviving students at Sandy Hook Elementary who are grieving for their friends, teachers, classmates, school staff and, in some cases, their siblings. Their stories serve as an enduring reminder of the overpowering grief and loss left in the Newtown tragedy's wake." Michael Yudin, a contributor for ED.gov Blog, writes: "Last week, I met with a group of high school students with learning disabilities who attend a dual-enrollment high school/college program at Mission Middle College in Santa Clara, California. The program emphasizes the use of technology, including the Bookshare accessible library, to help students earn college credit while still in high school. The Mission Middle College educational program is a collaboration of Santa Clara Unified School District and Mission Community College. The program takes on a student-centered learning environment where seniors can complete required high school courses while accumulating college credits." One in 5 people in the U.S. has some sort of learning disability like dyslexia, yet experts say that for many children, the problem remains undiagnosed longer than it should. Recognizing the early signals of such learning differences can be important for a child's success in school and life. Pediatric neuropsychologist Dr. Nichole Dawson has a son with dyslexia, and has teamed up with Learning Ally, a national nonprofit, to inform the public about dyslexia's early warning signs and to advise parents on what to look for. Children who lived in areas with high levels of "traffic-related air pollution" when they were a year old were significantly more likely by age 7 to have ADHD than children who lived in less polluted areas. The study, published in NIH's Environmental Health Perspectives, was conducted by researchers at Cincinnati Children's Hospital Medical Center and researchers at the University of Cincinnati. The study is the latest to suggest that pollution may play a role in the developing brain. Supporters of the Common Core State Standards are moving to confront increasingly high-profile opposition to the standards at the state and national levels by rallying the private sector and initiating coordinated public relations and advertising campaigns as schools continue implementation. In states such as Michigan and Tennessee, where Common Core opponents feel momentum is with them, state education officials, the business community and allied advocacy groups are ramping up efforts to define and buttress support for the standards — and to counter what they say is misinformation.